Well, after taking a few years off from blogging, I am ready to dive back into it. My husband has been almost like a cheerleader, constantly pumping me up to get this totally lucrative venture up and running again. And by lucrative I mean producing absolutely no money, but being a gold mine of otherwise forgotten family stories. So, anyways, if for some reason there happens to be even one of you out there who for some unknown reason had my blog bookmarked, I am assuming because you have been handcuffed to a desk and are desperately seeking a way to alert the world to your captivity, I am back at it. Now, I realize much has changed since my last real post. The first being that both my boys are now in school, the oldest in the mighty first grade and the youngest kickin' it new school in pre-k. We also are now in a new home. It is a total change of scenery. By that, I mean that it is exactly one whole mile from where we lived before. Oh, my husband is also threatening to nickname himself "The Satisfaction" and wear pink rimmed glasses in all places public if I watch another episode of Jersey Shore. Finish This Page, but click on the older posts, too. The knee-slappin,' cursin,' GOOD TIMES don't start or end on the front page, so read the older posts! Maybe you missed something. Maybe you forgot. I try to post daily, so read the older posts! 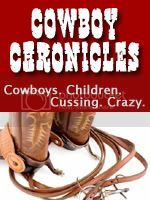 It Pays to Advertise on the Cowboy Chronicles! Follow Me: It's like a trainwreck you can't turn away from! Chronincle Your Cowboy Love. Put this on your site. You're lookin,' they are TOO! Advertise here. Raw Cool....Black is the new Blog! The daily blogs only cover a slither of the insanity with the Family Little, so keep up with my daily Twitter Blurbs to absorb all the madness! It's like buying a comic a beer at the comedy club. Except this isn't a comedy club. But, I am drinking a beer...as I type this. Or when you throw money in the guitar case of the sidewalk musician. Well, except that are really performing. Hell, it's worth a try, right? Donate for a good cause, me drinking beer and writing with no inhibitions. There's no telling what I'll disclose.